The Amount iPhone, iPod Touch, and iPad app converts numbers into different units for a wide-range of categories. The simple interface gives you quick calculations neatly. It can be customized for frequent calculations, and it can be a handy tool for cooking, remodeling, helping kids with homework, and winning arguments with your spouse or significant other. The speed and efficiency of the Amount iPhone app easily justify the $.99 download from the iTunes App Store. The process for calculating any unit conversion is the same with the Amount iPhone app. You enter a number on the calculator and press the confirmation icon in the lower right corner of the screen. You move to a new screen with the list of categories. The number in the pink dot to the right of each category indicates the number of units available. 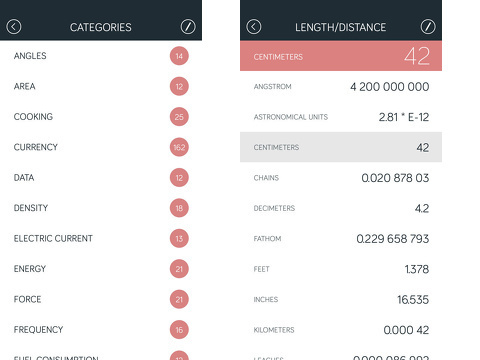 You tap on the category, and the units with calculations are shared in a list. If you need to edit the number you originally submitted, you can change it in the pink field at the top of the list. If you want to change the calculations based on a new unit, you just tap the unit and the adjustments are made. To open customization options pop-up, you hold a unit in the list to set as a default, copy value, or copy value with the symbols. The Amount iPhone app efficiently displays values within intuitive interface, and the vast number of categories makes this accomplishment more impressive. You can customize it as well. 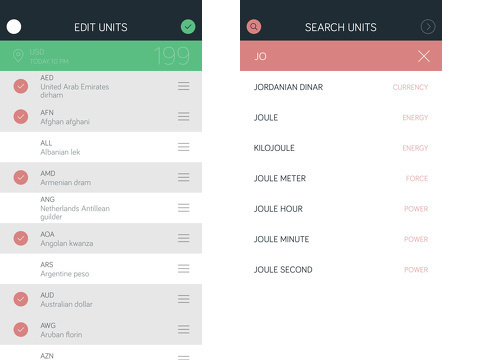 In the upper right corner when units are displayed, you can tap it to eliminate unneeded units. If you do not know what category to find your unit, you touch the search icon in the upper left corner to find the units list. There are currently 27 categories ranging from temperature and cooking to pressure and currencies. The currencies tool accommodates 162 conversions. The metric category is awesome. It shows the final number and the appropriate way to calculate. Other categories like area and angles help you with your DIY projects, and hopefully it will make your trips to Home Depot less frequent. Also basic physics calculations are covered with force and energy. As a parent, you will appreciate that you have a tool in your pocket, when the thought of scratching out a calculation on the back of an envelope while cooking dinner hurts. The Amount iPhone, iPod Touch, and iPad app is a simple tool with vast real-life applications. AppSafari review of Amount was written by Jenni Ward on February 17th, 2014 and categorized under App Store, Calculators, iPad apps, Productivity, Reference, Universal, Utilities. Page viewed 5001 times, 1 so far today. Need help on using these apps? Please read the Help Page.